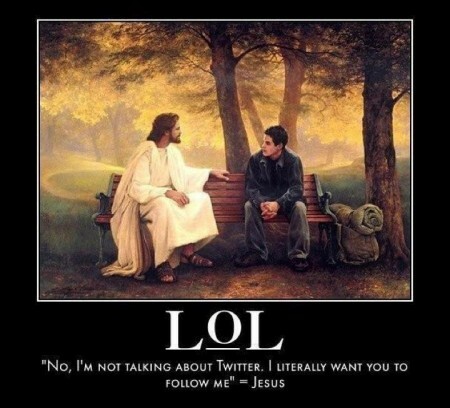 Jesus : No, I'm not talking about Twitter. I literally want you to follow me. Culture Jesus : No, I'm not talking about Twitter. I literally want you to follow me. * Currently the prints don’t have the “twitter” quote. But there’s some chance they could be available sometime soon. Please reply where I can find the author or purchase the print above. Thank you, Rhett Vestal, Midland, TX. I found it on Facebook. I haven’t been able to track down the original author yet.